We love our spouses. We really do. But we don’t love their snoring. We know that it’s not their fault. There are a lot of complicated reasons behind the act of snoring, and at the end of the day, we know that our spouses would stay quiet if they had any control over themselves. But this doesn’t make it easier to live with them. It doesn’t make it easier to sleep through the night while an ox pulls a cart through their nose. Thankfully, we’ve discovered an alternative to tossing and turning all night: anti-snoring ear plugs. Not only are they easy to use, but they’re also surprisingly effective at blocking out nighttime sounds and letting us rest. Do you want to learn more about earplugs for snoring? Let us take you on a little journey. With so many ear plugs for snoring on the market, it can be difficult to know which ones are truly worth the money. We understand the confusion. We’ve been in your shoes. We’ve looked at aisles and aisles of brightly-colored products and wondered how on earth we were supposed to choose between them. To help people who might be in a similar position, we’ve put together this comprehensive buying guide for anti-snoring ear plugs. The best kind of ear plugs come with a specific noise reduction rating (NRR). These usually range from 15 – 35 decibels, and the higher the number, the better the product. But don’t just scoop up a random package of ear plugs because they promise high-decibel protection! Despite what it might sound like in the middle of the night, your partner’s snoring isn’t actually comparable to a rock concert or a jet plane taking off. You won’t need something designed for construction workers to block out simple nighttime noises. In terms of decibels, snores are in the same range as everyday objects like dishwashers and vacuum cleaners. Long story short, you might not want to spend top dollar on a high-NRR product when a mid-NRR will do. Each type has its pros and cons, so you’ll need to do your research to figure out which is right for you. For example, foam plugs can expand in the ear for a snug, noise-cancelling fit, but they might not last as long as silicone plugs. They might lose their size and shape at a faster rate. You’ll have to decide for yourself which factor is more important to you. Some ear plugs are meant to be worn “as-is.” You just pop them into your ears and go to sleep. They don’t always fit right, but their universal size makes them a popular choice for people who don’t have the time or energy for something more complicated. On the other hand, if you are interested in a customized fit, there are plenty of ear plugs that will provide that option for you. We’ve already mentioned that foam plugs can expand in your ear until they fit just right, but you can also find thermoplastic ear plugs that can be molded to the exact shape of your ear. Another option is sending away for custom-made ear plugs that have been professionally fitted by a hearing specialist. It’ll be expensive and time-consuming, but if you have particularly sensitive ears, it might be something worth considering. The ideal ear plugs are the kind that you don’t even feel. It might take an adjustment period to get used to them, but after you’ve become familiar with the sensation, you should be able to mentally block it out. If your ear plugs are hurting you, that’s a problem. If the skin inside of your ear is red, raw, sensitive, irritated or bleeding after prolonged ear plug use, that’s a really big problem. Don’t ignore what your body is telling you as you experiment with different ear plugs. A little bit of discomfort is normal, especially during first-time use, but if the feeling doesn’t go away after several nights, something is wrong with your fit or material type. If you browse enough product reviews, however, you’ll start to notice that some products have gained a reputation for being better or worse for certain sleep types. They might not be comfortable when they’re pressing against your head in a side position, or they might work the most effectively when you’re prone on your back. The good news is that there are ear plugs suitable for every type of sleeper. You’ll just have to put in some effort to figure out which ones they are. Some ear plugs are only meant to be used 1-2 times before they’re tossed in the trash. Others can be washed and re-used until they fall apart. Both sides of the “disposable” debate like to pretend that they know better, but the truth is that neither type of product is inherently superior to the other. The best one for you will depend on your unique circumstances. Are you willing to clean your reusable ear plugs every morning? Do you have the income to replace disposable ones over and over again? Do you lose things frequently? Be honest with yourself about your habits before you decide on any type of ear plug in particular. If you have a problem with allergies or sensitivities, you’ll want to be careful about purchasing ear plugs. While the high-end ones are usually made with hypoallergenic materials, the cheap stuff isn’t always that luxurious. Check the label before you buy! These are just a few things to consider about ear plugs before you go down the rabbit hole of products, brands, features and costs. 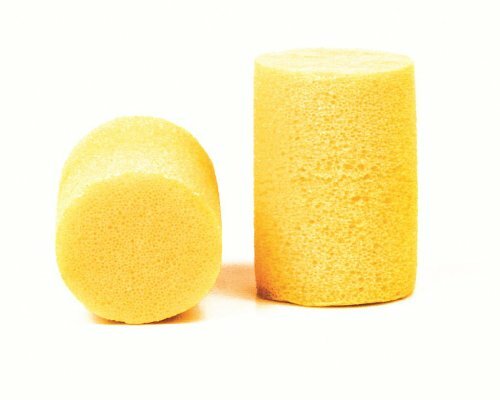 Now that you have a solid foundation, we can start recommending the best anti-snoring ear plugs on the market. We should disclaim right away that these are just our personal thoughts and opinions. We’ve tried every product on this list, and weighed various factors against each other to determine which ear plugs are our favorite. You might not agree with us. You might think that we’re totally crazy. We welcome the discussion! Let us know what you think about our top nine earplugs for snoring. Both useful and comfortable, the Hearos Ear Plugs are the first things that you’ll want to reach for when you’re besieged by snoring. You’ve probably seen Hearos products in stores. They’re one of the most popular brands of ear plugs on the market. Fortunately, they live up to the hype! The best thing about the Hearos Ear Plugs is that they’re supremely comfortable to wear. They’re made of a soft, flexible memory foam covered in a barely-there polymer, so they won’t itch and irritate even the most sensitive parts of your ear canal. This puts them a step above other ear plugs right out of the gate. The Hearos Ear Plugs are also very effective at blocking out snores. With a rating of NRR 32, they’re on the highest end of the noise cancellation spectrum. People have used them at concerts and gun ranges. They’re capable of blocking much more than just huffing and puffing at night, so you don’t have to worry about their efficacy. Another nice thing about the Hearos Ear Plugs is the fact that they’re reusable. They’re technically classified as a disposable product, and it’s true that they won’t last for more than a week or so, but this is a longer lifespan than many other throwaway ear plugs. You don’t have to immediately toss them into the trash. You can wring a few additional nights out of them before they start to flatten. The only real drawback of the Hearos Ear Plugs is that they can’t have contact with water. If you do plan on re-using them, you’ll have to wipe them down instead of rinsing them. All things considered, however, the Hearos Ear Plugs are some of the best anti-snoring ear plugs that money can buy. There’s a reason that their manufacturers are so well-known in the industry. They know how to create a quality product. Despite their attention-grabbing design, the Moldex Ear Plugs have a lot more to offer than just a vivid color. You can’t miss the Moldex Ear Plugs. With their bright purple surface, they don’t even attempt to blend in with your hair or skin tone. They aren’t discreet. They aren’t neutral. Their boldness was the reason that we decided to give them a try, and we’re glad that we did. It turns out that the Moldex Ear Plugs have a lot of substance to back up their style. For starters, they’re made with a soft and smooth foam that tapers at the end to provide maximum comfort in the ear. They’re also latex-free and PVC-free, so they won’t irritate you at all. These are the kind of ear plugs that you can pop in and forget about for the next eight hours. They’re also registered with a rating of NRR 33. This is one of the highest levels of noise cancellation provided by foam ear plugs, so they’re the real deal. Last but not least, the Moldex Ear Plugs are extremely easy to use and store. They even come with a little purple container that you can use as a carrying case. If you’re looking for a comfortable, convenient way to block out the sounds of your partner’s snoring, it doesn’t get much better than the Moldex Ear Plugs. Perfect for everything from snoring to sharpshooting, the Howard Leight Ear Plugs are very versatile products that you can use and re-use in all kinds of ways. The Howard Leight Ear Plugs might look simple, but there’s a lot of technology packed into their curves. For example, you might not expect their gentle bell shape to actually be an ergonomic fit that’s specifically designed not to fall out of the ear canal. If you’ve had a problem with other plugs becoming loose in the night, the Howard Leight Ear Plugs will provide a breath of fresh air. Despite their tight fit, however, they’re also quite comfortable. They’re made of polyurethane foam with a closed-cell foam skin that will resist the build-up of dirt and ear wax. They’re disposable, so you won’t be able to use them forever, but they have a decent longevity aside from that. You can clean and re-insert the Howard Leight Ear Plugs for at least a few nights before they go flat. Thanks to their soil-resistant foam skin, they won’t even stain or feel unhygienic during this time. As for their noise reduction properties, you’ll enjoy a full NRR 33. That’s one of the highest in the business, and it makes them suitable for all kinds of activities. Block out snores. Take them hunting. Use them at the mine. They’re up for the challenge. The Howard Leight Ear Plugs might not look as advanced as they are, but this just goes to show that you shouldn’t judge a book by its cover. Or, in this case, you shouldn’t judge ear plugs by their deceptively simple design. Don’t get these confused with the other “Moldex” ear plugs that we’ve already reviewed. The Moldex Pura-Fits are a completely different product, and they’re so good that they deserve to be appreciated for their own sake. Longer and slimmer than a lot of other ear plugs, the Pura-Fits use their unique specs to fit even more comfortably in your ear. 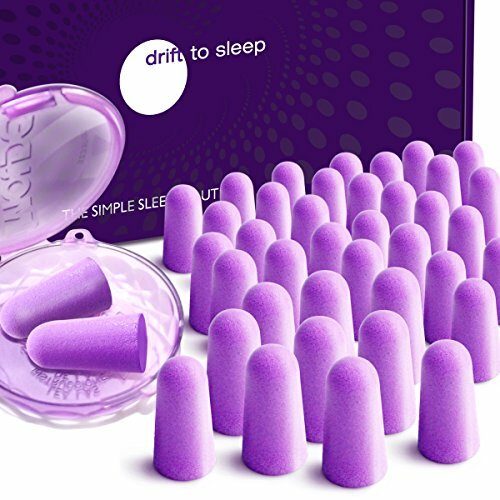 They’re ideal for people who have struggled with other ear plugs falling out or wiggling around whenever they change sleep positions. The Pura-Fits live up to their name by providing a better experience. Insertion is simple: Just pinch and roll the plug into a compressed shape before putting it inside your ear. As you gently release the pressure, the foam will re-expand in your ear canal until it forms a barrier between you and outside noise. The Pura-Fits weren’t designed for snorers. That’s why they’re bright green; the manufacturers wanted them to be visible during things like workplace compliance checks. Since we’ve worn them we can assure you that they’re just as effective against snores as industrial machines. If they can work against power saws, they can work against the huffing and puffing of your spouse! Swim, sleep, work, study and travel with ease when you’re wearing the Ohropax Wax Ear Plugs. As much as we love foam ear plugs, it’s good to explore other options, too. 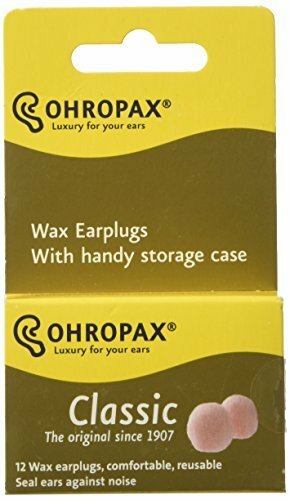 This is why we purchased the Ohropax Wax Ear Plugs, and we were pleasantly surprised at just how helpful they turned out to be. Like the name implies, the Ohropax Wax Ear Plugs are made with a soft wax compound. They’re also covered with a thin cotton layer for an easy glide into your ears. If you’ve only ever used foam ear plugs, you might be a little surprised at the way that these fit and feel. It isn’t unpleasant, but it’s different. It might take you more than one night to get comfortable with them. Once you’ve acclimated, however, you’ll find that the Ohropax Wax Ear Plugs are great ear protection tools for a variety of environments. Not only can they block out snores, but they can also be used in the bathtub or the pool. They’re completely waterproof. They’re also useful while traveling, especially since they come in a little tin box that’s easily thrown into your luggage. If you’re ready to branch out from foam ear plugs, give the Ohropax Wax Ear Plugs a try. They won’t disappoint. Soft but strong, the DuraPlugs offer a low-pressure but high-resistance method of noise cancellation. The best thing about the DuraPlugs is that they’ve been officially classified at NRR 32. This means that they were tested in a laboratory setting and given a real, measurable level of noise cancellation. Not all ear plugs can make this claim. Another worthwhile aspect of the DuraPlugs is their comfortable fit. They’re made with a soft, low-pressure foam that won’t itch or irritate your ears even after a full night of use. They also have a slick surface rather than a textured one, so you’ll never experience any painful friction as you place them in your ears. The flip side of this glossy surface is that they can become slippery when they come in contact with sweat, water or skin oil. You’ll need to be careful about keeping them dry. They also lose their shape pretty quickly. 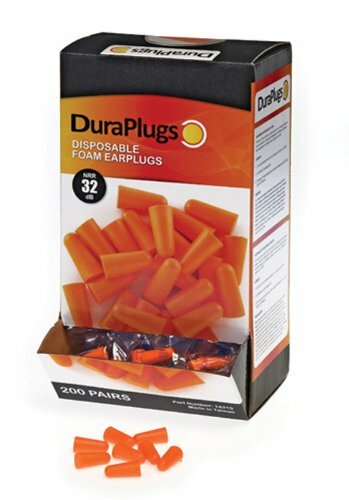 While some disposable ear plugs can be re-used multiple times before they actually need to be trashed, the DuraPlugs aren’t like that. They’re the kind of ear plugs that are worn and tossed after one night. If you don’t mind their short lifespan, however, the DuraPlugs are very handy ear plugs that will definitely help with snoring problems. 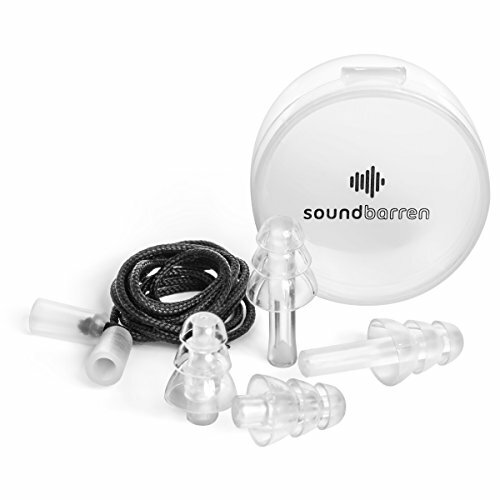 If you’re getting frustrated with the same old ear plugs offered by every brand, consider something totally different like the SoundBarren Ear Plugs. Instead of being bright and visible for compliance checks, they’re completely transparent. You can hide them in plain sight. This makes them great for public use as well as private nighttime use. They boast a three-tier flanged design that works on multiple levels to fit comfortably in your ear. They’re made of silicone instead of foam or wax. Long story short, the SoundBarren Ear Plugs don’t even look like ear plugs. They’re more like headphones that just so happen to block sound instead of broadcast it. If you’re tired of the usual anti-snoring ear plugs, consider these alternatives! Keep your plugs in place from dusk until dawn when you choose the Decibullz Custom Molded Ear Plugs. 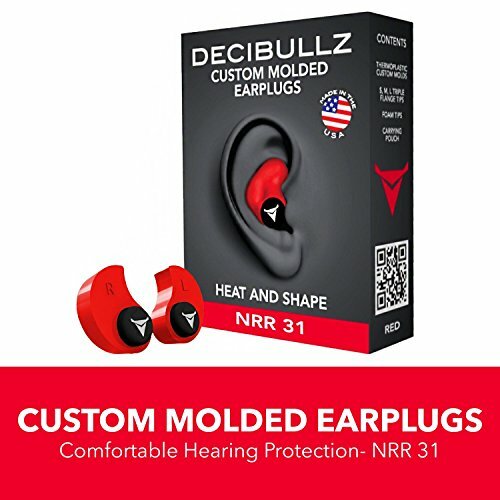 Created by an Olympic-level gymnastics coach, the Decibullz are some of the best ear plugs on the market when it comes to sheer ingenuity. The first thing that you’ll notice is that they have a unique shape and fit. They cover the entire opening of the ear instead of just sliding into the canal. This is because the Decibullz employ a customizable “shaping system” where you actually mold the product to the exact form of your ear. It’s easier than it sounds. Since the main piece is made of thermoplastic, it softens in hot water and presses into place with a firm hand. You can do the whole thing in less than five minutes. The results, however, are remarkable. Not only do the Decibullz eliminate loud noises, but they also stay in place for the entire night. Even if you toss and turn, they won’t fall out. Why would they? You molded them to the contours of your own ears. There are other great things about the Decibullz, including the way that you can switch between small, medium and large tips for an even better fit. But their thermoplastic material is the true takeaway of the Decibullz. It just doesn’t get more innovative than that. The E-A-Rs are proof that you don’t have to fix something that isn’t broken. 3M invented some of the very first foam ear plugs on the market. The E-A-Rs are a throwback to that design, and they’re just as nice today as they were when they first debuted. Because of their vintage style, they don’t really look like the ear plugs that dominate the current market. But don’t let that fool you into thinking that they’re any less comfortable. They’re made of low-pressure foam that will gently expand in your ear until they fit snugly and securely. The E-A-Rs are also fire- and water-resistant. Don’t jump into a pool while you’re wearing them, but don’t worry about a little sweat or skin oil. They’ll even resist expansion in humid conditions, so they’re perfect for those hot summer nights when your partner’s snores are at their worst. The one flaw of the E-A-Rs is that they only offer a rating of NRR 28. While this isn’t terrible, it isn’t very impressive, either. At the end of the day, however, the E-A-Rs prove an important point. You don’t have to buy fancy anti-snoring products to get the job done. Sometimes, a pair of classic ear plugs will work just fine. You’ll have a lot of options when you venture into the world of anti-snoring ear plugs. If we can teach ourselves the basics of things like noise reduction ratings, so can you. Use these tips and recommendations to get started. One day, you’ll find the perfect pair of ear plugs for snoring that will let you sleep through the night and get a deep, peaceful rest. VitalSleep Review – Is it Worth the Money?